Canaletto was trained by his father, a painter of theatrical scenery, and early on worked alongside him in this capacity. By the 1720s he was specialising in more or less topographically accurate views (vedute) of Venice, which made him popular with English grand tourists. His greatest admirer was Joseph Smith who acted as Canaletto’s agent, commissioning works on behalf of English clients. Smith himself also formed a collection of Canaletto’s pictures, which he sold in 1762 to King George III. Views / some representing actual sites, others imaginary/ by / Antonio Canal / and by him etched and set in perspective / humbly dedicated / to the most illustrious / Joseph Smith / Consul of His Britannic Majesty to the Most Serene / Republic of Venice / as a sign of esteem and homage. Less than half of the etchings depict identifiable places in Venice, and only a few of these, surprisingly, portray the city’s famous landmarks – there is not one view of the Grand Canal, for example. Others show sites on the mainland, including views along the Brenta River and canal scenes of Padua and its environs. The remainder are capricci, which is to say fanciful views combining real and imaginary buildings and ruins in fantasy settings. In some instances the real and the imaginary are so artfully combined that it is not easy to distinguish one from the other. Each of the plates is signed and those purporting to be drawn from nature are inscribed with Canaletto’s own titles. Only one etching is dated 1741, however Canaletto may have started working on them in the late 1730s (and indeed continued to make them into the mid 1740s) if we take stylistic differences into account. Nor do we know the date of publication of the series, although it must have been some time after Smith’s appointment as consul in June 1744 and before Canaletto’s departure for England in 1746. Aside from the desire to try his hand at something new – possibly inspired by the example of other Venetian painters who were making etchings – Canaletto’s decision to pursue an unfamiliar medium appears to have been encouraged, in some measure at least, by the outbreak in 1740 of the War of the Austrian Succession, which had the effect of greatly reducing the flow of tourists to Venice and hence of potential patrons. Consequently, Canaletto painted fewer Venetian vedute and devoted more attention to etching. Without any apparent training or known technical assistance he applied his consummate drawing skills and developed an etching style entirely his own. While his printmaking career may have been short, the results were extraordinary. 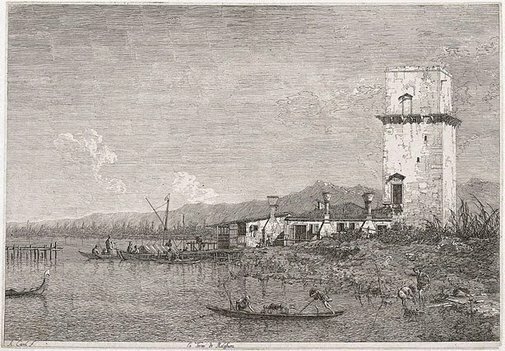 Canaletto used the etching needle to draw in an idiosyncratic manner with short, parallel strokes instead of cross-hatching. His made his line wonderfully versatile and descriptive by biting to varying depths in order to create darker tones. This was achieved by stopping out certain areas with varnish before putting the copperplate back into the acid bath for a second biting. The effects can be appreciated in Canaletto’s distinctive treatment of the sky, where the ranks of loose horizontal lines, darker in some places and lighter in others, seem to pulsate with energy. The same vibrancy is achieved with the massing of dark curves to suggest the ruffled surface of the water. La torre di Malghera is one of Canaletto’s most restrained and harmonious compositions. Against the backdrop of the Euganean Hills, the tower of Malghera (now Marghera) stands out in brilliant light. Raised as a fortification by the Venetians in the 15th century and demolished in the early 19th century, the impressive structure is shown isolated and deserted on a sleepy byway of the Venetian lagoon. Unremarkable day-to-day activities carry on around: two boys dig for eels at the water’s edge while a fishing boat glides past, and fishermen gather around a wooden jetty in the middle distance. Signed l.l., [incised plate] "A Canal...". Not dated. Renée Free, AGNSW Collections , 'The Western Heritage, Renaissance to Twentieth Century', pp 108-172, Sydney, 1994, col illus p 122. Prints & drawings Europe 1500-1900 , Sydney, 2014, p 80, col illus p 81.